Income Tax is levied on the slab system on the total income in case of the individuals. The tax system is progressive i.e., as the income increases, the applicable rate of tax increases. Some taxpayers in higher income slab may tend to divert some portion of their income to their spouse, minor child etc to minimize the tax burden. To prevent such tax avoidance, clubbing provisions have been incorporated in the tax. An assessee is generally taxed in respect of his own income. However, there are certain cases where the assessee has to pay tax in respect of income of another person. The provisions of the same are contained in sections 60 to 65 of the act. All income arising to any person by virtue of the revocable transfer of assets is included in the income of transferor. a) Any income such as salary, commission, fees or any other remuneration arising to the spouse of the individual from the concern in which such individual has a substantial interest. 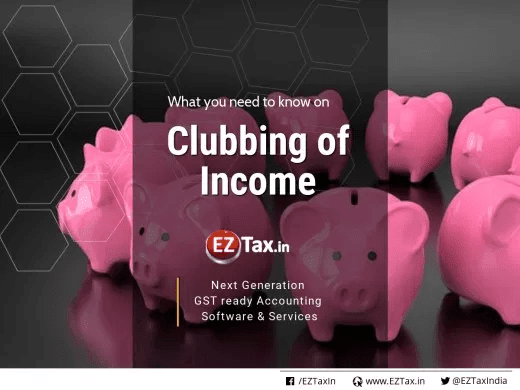 Exception: This clubbing provision does not apply if the spouse of the said individual possesses technical or professional skills and the income is solely attributable to those skills. b) When there is a transfer of an asset (other than house property) from one spouse to other otherwise than for adequate consideration, any income arising to the transferee from the transferred asset shall be included in the total income of the transferor. Exemption: If the income of the individual includes the income of his/her minor child, then such parent shall be entitled to an exemption of Rs 1500 in respect of each minor child.